On Tuesday, June 14, "Norm Macdonald: Me Doing Stand-Up" will be released nationwide on DVD by COMEDY CENTRAL Home Entertainment and Paramount Home Entertainment on CD by COMEDY CENTRAL Records and download-to-own including iTunes and Amazon Video On Demand. In addition, the special will be available in high definition on Xbox LIVE Marketplace and Playstation Store. 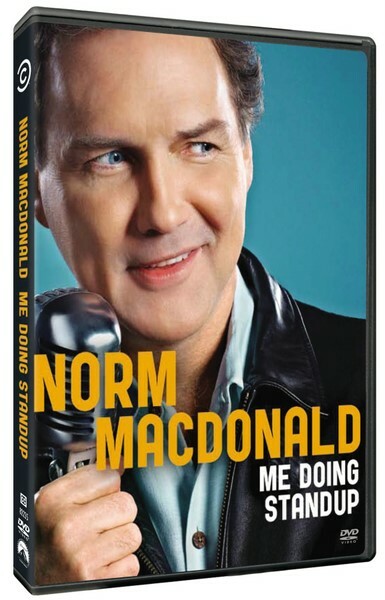 "Norm Macdonald: Me Doing Stand-Up" DVD is uncensored and uncut and features an extended version of the stand-up event featuring material not aired on COMEDY CENTRAL and over 30 minutes of bonus features including: the pilot episode of Norm’s sketch show "Back To Norm;" the animated featurette "The Twelve Days of Christmas;" and Macdonald's epic and unforgettable appearance on the "COMEDY CENTRAL Roast of Bob Saget" in 2008. Pilot episode of Norm’s sketch show "Back To Norm"
Macdonald's epic and unforgettable appearance on the "COMEDY CENTRAL Roast of Bob Saget" in 2008.